Ryan N. Gajarawala The Loop Lab is an eleven-month-old nonprofit founded for underrepresented youth to provide professional audio and video training. It’s the absence of sound behind the narrator’s voice that grabs me. I’m standing in a small room, staring at two desk speakers. The voice emerges clear as day — stoic, intentional, measured. No opening jingle, no pithy advertisement, no cloying tone asking you to play along for 59 more minutes. I’d never listened to a podcast like this before. I expect he’ll tell me more about mass incarceration: the problem, the solutions. Instead, he tells a story: His own father was incarcerated for five years and then deported to Colombia. Suddenly, vibrant music plays. When the music subsides, I hear the muted hiss of audio recorded over the phone, and an older voice introduces itself as Juan Diego Melguizo — the narrator’s father. As the first voice poses questions to the second, sound effects punctuate the dialogue — a record scratch after the elder Melguizo says he was making five to six dollars an hour when their family was growing, ominous piano music as the younger Melguizo poses a question, closing the gap between himself and me, his audience. “So imagine you're getting paid something as little as $5 an hour for a” — here, an expletive is bleeped out — “job, with few other options for money. And all the while, you have a growing family and you need to make ends meet. Would you take the quick money?" I’m caught off guard by the two jarring clangs that follow. Quickly, soft string music pulls the story along, gliding over the rhetorical interrogation of a couple moments prior. The narrator’s father describes his own arrest, incarceration, regret, family separation, deportation, and new life. Anticipatory piano music matches the intention and the intensity of the narrator’s final words. As the story reels toward conclusion, I expect another couple of minutes of audio — at least. The end feels like the exposition of a whole new story. The narrator reflects: “My choices, my life, will blow the door off the hinges. And I don't know how I'm going to do it, I don't know where I'm going to do it. But I know I'm going to be there for my kids." I cling to every word. “So that’s about 10 weeks in,” Matthew C. Malikowski says, breaking the silence that hangs after the audio subsides. I snap to attention, the podcast still echoing in my mind, and realize I’m back in the Loop Lab’s desktop computer-filled media room. Malikowski is referring to the amount of time the young narrator — whose name, I learn, is Christian X. Melguizo — had been a trainee of the Loop Lab before producing the podcast. Melguizo says that, as he made the podcast, he found himself surprisingly invested in the stories of those imprisoned. “I feel like that's not really heard, so making a piece that kind of represents everything, not just their incarceration, was important,” he tells me. Melguizo never imagined writing and editing a podcast episode, let alone one about his father’s deportation. He’s a rapper, so he expected that any kind of career development would mean working to professionalize his music. Then he arrived at the Loop Lab. Christopher C. Hope, a future co-founder of the Loop Lab, first arrived at The Port to intern at the Pentecostal Tabernacle. At the time, he was a Harvard Divinity School student studying for his masters of divinity. His internship tasked him with reaching out to the Cambridge community. Hope quickly began to form bonds with young people in The Port. "People internationally and even nationally think about Cambridge, and they often think about wealth, they think about Harvard, they think about MIT, they think about biotech and innovation. They don't necessarily think about the local drug trade, unsolved murders and shootings, and unfortunately The Port neighborhood has become infamous for all of that over the past many years," says Hope. Indeed, The Port is home to a disproportionate number of the city’s murders and drug offenses. According to Cambridge’s 2016 neighborhood statistical profile report, it has the second highest poverty rate of all Cambridge neighborhoods. At the same time, these same young people live “blocks away from Kendall Square and a giant wall of glass and steel,” says Malikowski. Data collected from the Cambridge Community Development Department reveals that in Cambridge alone, there are 312 firms described as life sciences, high technology, and clean energy companies. In January of this year, Facebook moved its Boston headquarters to Cambridge. Hope became dedicated to uplifting the voices of people he encountered in The Port. While in school, he started Hip Hope Nation, a Harvard Radio Broadcasting show dedicated to talking about politics and hip-hop culture. He brought youth from The Port behind the scenes of his show, providing an opportunity for young people to experience music and audio production. These local young adults helped him with the engineering, scriptwriting, and research for his show. He became well-known in the community. After he graduated from the Divinity School, Lillian Hsu, the director of public art and exhibitions at the Cambridge Arts Council, the city’s public art nonprofit, reached out to Hope about his interest in starting a radio station in The Port. Together, with Moise Michel and Tyrie J. Daniel, they began to build the idea that would become the Loop Lab. On bright summer days in 2017, Hope would camp out with boxes of pizza for hours at a time at Clement Morgan Park in The Port. He would sit with young people on picnic benches and ask a question: If you had a blank check, what would you want to learn from a community program? He recorded their answers on his phone and took notes. Audio and video production interests emerged consistently in those conversations. He was also surprised to hear that the young people he encountered wanted to know more about financial literacy, maintaining one’s identity in corporate spaces, and conflict resolution. The desire for jobs connected to the city came up repeatedly, says Hope. At the same time, many voiced frustration. Many he spoke to “feel like they’re being pushed out,” he says. According to Malikowski, many Port residents cite low employment as a major issue for young people who do not attend college after graduating high school. Their age makes community and youth programs less accessible, and that gap is disenfranchising. Hope says these informal surveys of the community were integral to the design of the Loop Lab. When thinking about solutions, Hope places faith in “the wisdom of the local folks that live it day to day,” he says. “I'm a believer that these young adults know the solution to their issues and their challenges. They have the solutions — they are the solutions,” he says. This past October, with funding from a series of grants, the Loop Lab opened its doors. The lab’s educational, production, and headquarters space is tucked at the end of a dimly-lit hallway on the second floor of an unassuming mixed-use office and residential building. The office is just a 12-minute walk from the gates of Widener. The lobby splits off into two rooms — the media lab and an alternate office space. As I enter the media lab, I’m encircled by tables, desktop computers, and grey soundproofing panels on the perimeter of the room. It’s small; if I were to imagine trainees sitting at each computer, there might be enough room for three people to stand close together in the remaining space. It feels, in other words, like a space befitting a nonprofit launching its inaugural program. Malikowski believes the key to helping young people find employment in the creative economy is “educating the whole person,” combining “hard skills” — things like podcasting, AV installation, camera work, and sound design — with “soft skills” like interviewing and professionalism. Using the audio produced during that session, trainees were then asked to edit a shortened, coherent dialogue clip of their fellow trainees. Since the program’s inception, trainees have embarked on their own projects at the Loop Lab. Many of the stories are tied to their communities. Tyrie J. Daniel, a trainee, describes himself as a “foodie.” His favorite project was a podcast called “The Tastes of Cambridge,” where he interviewed owners of restaurants that had been serving the community for more than 10 years. Daniel says he “had seen that there were a lot of restaurants around that weren't really feeding the population” — in other words, many restaurants were geared toward high-paying customers rather than local residents. So he investigated community anchor stores — ones that existed before the city’s gentrification. “There's a lot of kids that have stories that are unheard in the city and unheard to people who think they know what Cambridge is about,” says Jeff M. Solomon, a trainee. Solomon created a pilot episode of a podcast called “Dark Falls,” centered on four high school students who have depression and meet through a school club. "My mission and my vision is to make content to help people get out of this depression stage of feeling sorry for themselves and beating themselves up because I know how it feels, I've experienced it, I still experience it now,” says Solomon. "I just want to be able to give those tools to those type of kids so they can be as productive as they can be in society." Some of the trainees say that they hope the program will expand — across the city and in the number of young people served. “It should be an option for a lot of kids coming out of high school who don't know what they want to do," says Melguizo. Right now, the Loop Lab is required to focus their programming on The Port, a designation the founders used when applying for funding from ArtPlace America. This means all trainees must be tied to The Port neighborhood in some way, following the model of a “live, work, and pray” connection, says Malikowski. As it grows, the Loop Lab plans to “be better equipped to handle some of the case management style stuff” of those with different difficulties. The group’s limitations in trainees is a product of “growing pains” as it finds more financial support, Malikowski says. Like any fledgling nonprofit, there are other financial limits to the Loop Lab’s scope. The Lab currently has only two staffers — Hope and Malikowski. Despite a potentially limited scope, Malikowski defends the Loop Lab’s dedication to high-impact work with the students, which he believes is actually best enabled by their current low head count per cohort design. Part of that high-impact work comes from connecting with every trainee. Malikowski says that it can be difficult to stay updated with each trainee’s life and ensure sustained engagement when each trainee has a busy life taking care of family or working outside of the program. As I conduct interviews in one room of the Loop Lab, uproarious laughter from the media lab flows in, punctuating my conversations. 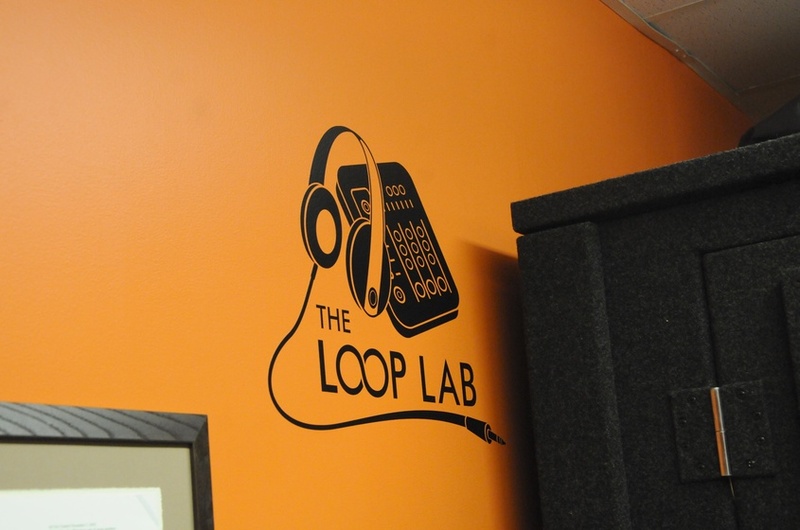 Tevin Charles, a trainee who started a podcast called “Technologically Trapped” about technology and its impact on our lives, says that the Loop Lab has become "a home space for learning and creating." The Loop Lab’s focus is on giving young people the skillset to work in the creative industries that can be a part of the gig economy. As a result, the Loop Lab is unlike traditional workforce development — it’s not necessarily about working toward a certification and slotting immediately into a nine-to-five desk job. It’s about building creative and audio video skills in trainees so that they may pursue a self-determined and individual, albeit less clear-cut, path. Improving representation in media is a driving mission for the Loop Lab. They hope to create a market for “diversity media creators,” one that doesn’t currently exist in Cambridge. “A corporation is not going to very easily go out into the corporate filmmaking community in town and find themselves a partner who is in an organization that is mostly people of color — that's not something that's easy to find in this town,” explains Malikowski. However, the one-to-one gender ratio they hope to reach has remained elusive in this first cohort. Currently, there are four men and one woman in the cohort. Out of 19 applicants, only three women applied. In their next round of community outreach, Malikowski says he wants to see what factors are driving their gender disparity in applications. They hope that further engaging the community will build a larger applicant base than the first cohort, one built largely by word-of-mouth recruitment for applications. When Jeff Solomon, a rapper, entered the program, he was focused on his music. After almost five months at Loop Lab, he’s also interested in storytelling through spoken word and instrumental backing. He says wants to hone his skills so that he’s a go-to creative that people recommend if someone needs music guidance, a video editor, or an audio editor. Thanks to his time at the Loop Lab, Solomon’s perspective on the future has shifted. For others, their initial vision has been bolstered. Melguizo says he continues to see improvement to his music as the main thing he expects to take away from his time at the Loop Lab. Daniel isn’t sure where his entrepreneurial instincts will take him, but he says that the Loop Lab has given him skills he’ll be able to use in the future. He says he’s been reminded of all that he can do. "All my life I've been told 'no, you can't do that; you can't do this.' But when I actually get into the field, I see they're doing things I've actually always wanted to do and have the capability to do, but it's like I've just been pushed out for some reason," he says. Now, he’s fighting his way back in. Change is a defining feature of the Loop Lab. "Whatever brings you to the door is one thing, but we want to open your horizons and open up your mind to what kinds of possibilities exist for you in the audio video digital content creation space,” says Hope. To him, the purpose of the Loop Lab is showing creatively-minded people that everything is possible for them and empowering them to act on those possibilities. —Magazine writer Vivekae M. Kim can be reached at vivekae.kim@thecrimson.com. Follow her on Twitter @vivahkay.